Warm weather always makes me want to go on day trips to the park, zoo, botanical gardens, and beach with family and friends. When I do a day trip I always pack a tote bag full of things I'll need for the day...snacks, a drink, a fan, ID, money, sunblock, a cardigan, sunglasses, cell phone, and something to do if I'm relaxing somewhere or the trip to and from is long. I stuff a lot of things in mine, because they hold so many things that I'll need through out the day. When not traveling, I use them for creative meetings when I need to carry artwork, a sketch book, and small purse, for post office trips when I have several small packages, and for shopping, so I can put small purchases into the bag. Tote bags are the simplest ones to make, as they don't have closures and the shape is a rectangle. Though they are a basic kind of bag, that doesn't mean they shouldn't be decorative too. 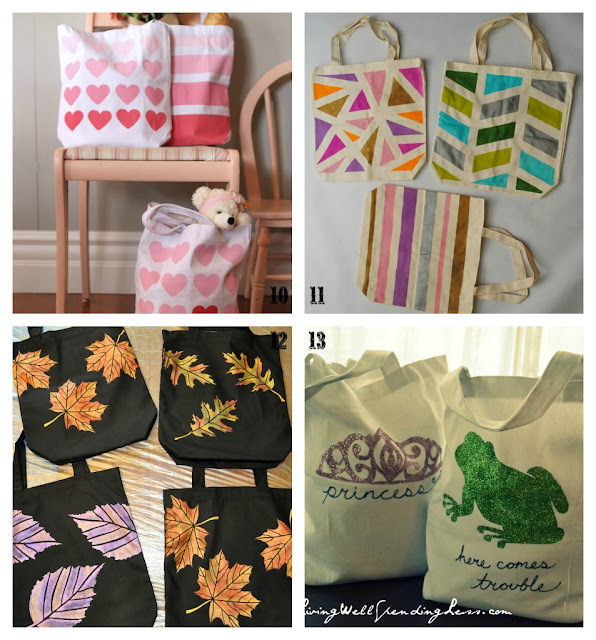 Today, we'll look at three ways to make a tote bag, and a bevy of ways to decorate them. Now, if you don't want to make your own, you can use an old one you already have or buy blank ones at a craft store. 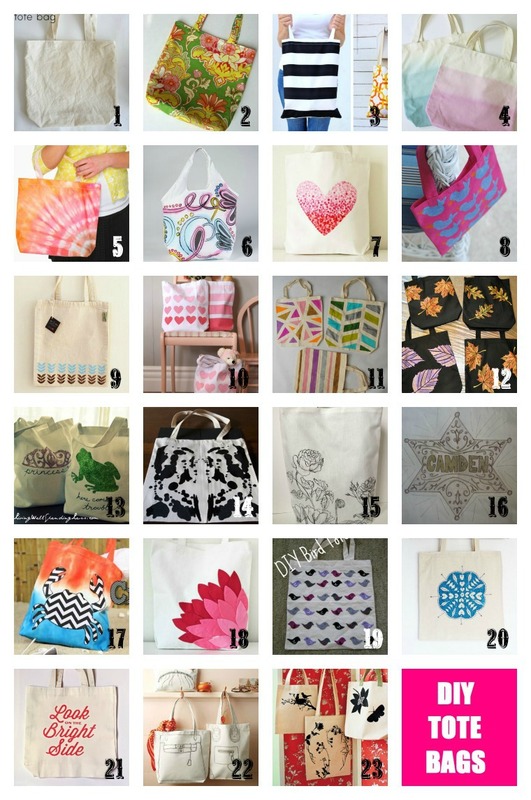 Though these tutorials are for tote bags, feel free to use the decorative ones on any type of fabric bag. 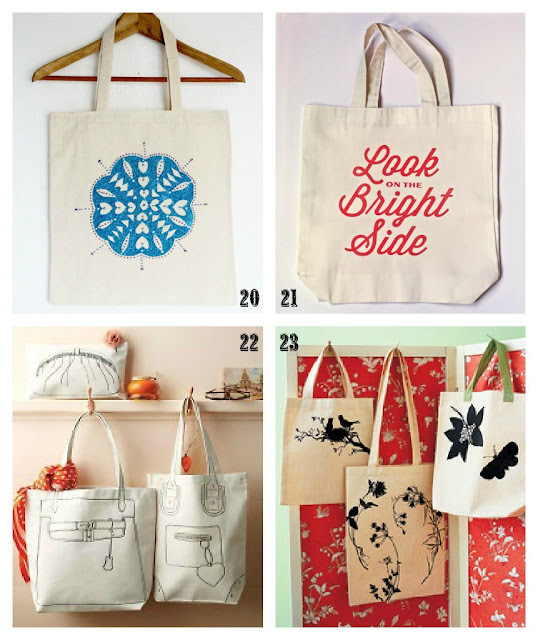 Starting with the basics, we need a tote bag to work with. If you can't find an existing one you like, you can sew your own. These three are common styles of tote bags...a basic, a reversible (2 bags in one! ), and a bag with a pocket (got to love pockets!). There are lots of great cotton fabrics available that would make great bags. If you can't find a print or color you like, you can make your own. Dye is one of the easiest ways to instantly transform the color of a bag. You can dye your bag a solid color, or you could get more creative. Ombre and dip dyeing has been a hot trend in the craft world for a few months. It's one that comes back every few years. It's a great way to get a gradient with one color of dye, but for an ombre, try using two or three colors, blending them into each other. Tye dye is also a popular dying method that never goes out of style. Tulip has great One Step Dyes that work fabulous for tye dye projects. If you want more control of the colors, you can paint with that same dye. Foam brushes soak up the dye the best and paint with for this application. After you've followed the instructions for using the dye, you can use fabric markers or any of the other tutorials below to add more flair to your bags. Stamps are a simple way to transform a bag with having to be a skilled artist. You can use store bought stamps or make your own. Use some fabric paint with the stamps to create patterns and designs on your bag. You can also use common items found around your house, like the pencil eraser for the heart bag, or a toilet paper tube for circles. The pattern, colors, and placement is up to you. Look around your craft store and house for things that would work for stamps or to add layered patterns with paint to your bags. Stencils can be slightly harder to work with than stamps, but they are easy to make with tape and freezer paper if you want to create your own design. Your limits are really just your imagination. If you can't find the design you want in a pre-made stencil, use freezer paper to draw or punch out your design. If it's a drawing, make sure the design is bold enough to not get muddled when painting. You'll iron on the freezer paper stencil to your bag, wax side down. Then, paint the exposed spaces just like you would with a tradition stencil. If you want a more geometric design, use masking tape to map out your design. Make sure the edges are firmly adhered to the fabric, for clean lines. Painting is just like a traditional stencils. As you see in the leaf bag, your painting can be various colors with in the same stencil to create a blended look. To add some glimmer like the princess and frog bags, use glitter bond adhesive instead of paint, and shake on lots of fine glitter! There are lots of great acrylic and fabric paints on the market that can help give your stencil designs some pow! If you are an artist or more adventurous, do a freehand design. The Rorschach Inkblot is a great freeform design that's beauty is in the unexpected results after squishing the two halves together. You don't need much paint. You can use regular black fabric paint for this too, if you don't have screen printing ink. I love botanical like I mentioned at the beginning, so the botanical bag is beautiful to me. If you're not a floral person, you can create any design using this sketch and paint technique. I do love drawing and found that paint pens work great for drawing and painting on fabric at the same time. I created the sheriff bag for my daughter's friend. The pens are easy to use on fabric. 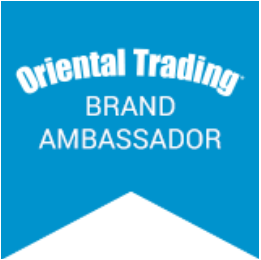 My design is very detailed, but of course you can choose what ever design you want. If you are more of a texture person, perhaps using fabric appliques would work for you. These ladies made their own appliques and techniques for creating their design. If you don't want to make your own design, look for pre-made beaded, embroidered, and lace appliques to add to your bag. Those are often iron-ons, so I recommend stitching them around the edges, for extra security. With the crab, you can see there is a great fabric fusion product that will keep your applique secure onto your fabric. The dimensional paint around the edge of the crab adds texture, but also prevents fabric fraying. The other two tutorials use fabric glue to help with the arrangement, but also use stitches to keep the pieces secured better. You could do the same with the crab if wanted. 17) On i Love To Create's YouTube Channel, they demonstrate how to make a Crabby Tote. Iron ons are great if you want a crisp look similar to a screen print. Alisa's Sparkle Market Totes use Tulip's Fashion Glitter Shimmer Transfer Sheets and snowflake like cutting to make delicate designs. What's nice about this product is that you can use the cut out pieces for this or other projects. The dimensional paint give a nice added texture and details. The other 3 tutorials use a computers and transfer paper to create their precise designs. When doing any design, especially letters, make sure to reverse your design before printing it. That way, when you iron it onto your bag, it will appear the intended direction. 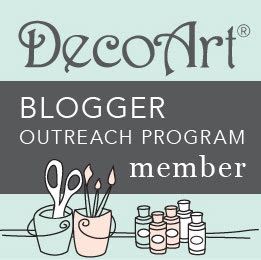 With the trompe l'oeil bag, you can paint on fabric dye, use fabric markers or crayons to fill in the design. I love the concept of "coloring pages" on bags. The silhouette images look neat layered with different colors. With the floral images, it would be a buzzing garden look. What ever method you chose, you can easily transform a plain tote bag into a wearable piece of artwork. Happy makery!